Original public sharing of this story was on deviantArt, on November 30, 2014. This story is © Sequoia Campbell/Sequoia the Storyteller; All rights reserved. -Whim: The word for ‘human’ on planet Esmeralda. Also, ‘Whimsy’, ‘Whimsy-kind’, ‘Whimsy-folk’, etc. 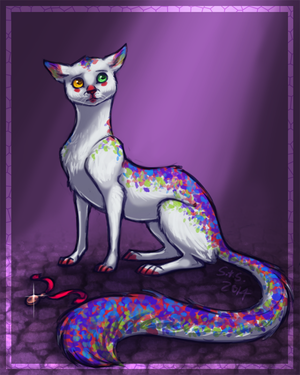 -Acrobat: A colorful and graceful cat/viverrid creature. The door is opening… Linyan is leaving. Past her, just outside, I glimpse the group of friends she’s to leave with. She looks back at me once and she says something in Whimsy-tongue… I’ll probably never learn ALL of her species’ language but I know Linyan, and I can read her better than any other Whim. She’s asking me to come with her and her friends. There’s a smile on Linyan’s face but it’s empty. I look into her eyes and look for the light that was always there when we were younger. Why is it gone? There’s cheer on the surface of her eyes but beyond that… emptiness. I can feel it. And every time I look into her eyes nowadays it’s always the same… and it makes my fur want to stand on end. But I cannot say any of this. So I only look away, and stay still, not moving toward Linyan or the door. I hear her say something that I know means ‘suit yourself’, and the door closes, hiding her and her friends behind it. And they’re gone. In looking down, I notice the shiny tag that hangs from my neck. I paw at it musingly… though the Whim language is almost as impossible to read as it is to speak, I know the Whim-scribbles on it spell my name. ‘Scatterflakes’. That is the name that Linyan gave me when she was a child, and I was just a kitten, no more than three months old, coming to live at her house for the first time. ‘Scatterflakes’… does it even mean anything anymore? Linyan wasn’t always this way. Back in those younger days she was my best friend in the whole world. She’d talk to me and look me right in the eyes seeing my spirit, and I would see hers. How bright it was. She and I would get up to all kinds of mischief and even sneak outside the town walls to play in the tall, golden grass of the moor… that’s not allowed, supposedly, but we loved to do it, so we snuck out to the hills whenever we could. We would sleep in the same bed and share the same food (though I never liked vegetables). She would tell me her secrets and I would always listen, learning the Whim language slowly, but surely. And I would not have told her secrets even if I could. We were inseparable. And now… now everything’s different. I’ve reached full size, and Linyan is older too… but that’s not what’s wrong with her. There’s something else; I can sense it. It all changed after she turned from child to adolescent, and her parents took her away to see some lady… they mentioned this lady’s name often, preparing Linyan for the fact that she would have to go see her like all the other children her age. But I can’t remember the lady’s name. If I could, maybe I’d be able to find out more. All I know is that when Linyan came back from seeing the lady, she was almost not Linyan anymore. And she hasn’t been since. And I miss her… something awful. I get to my feet. I can’t stand it anymore. I need to find out the truth of what’s happened to Linyan. I begin padding my way through the house toward the first open window I can find. It’s high up, but that’s never been a problem for me… I am an Acrobat after all. I’ve been a great jumper since I was a kitten, and I’ve only gotten better with time and practice. I fix the windowsill in my sights like prey, and I leap. Up and up I go, spinning and flipping through the air a few times on the way… I just can’t resist. Some Acrobats specialize in tight-roping, some in wall-hopping, some in obstacle-coursing and some in jumping and flipping… I am a jumper and a flipper. Always have been. It’s what my heart tells me to do. So after a bit of twirling and tumbling in the air, I land on the windowsill, effortlessly and with precision. Now, with the world outside open to me, I leap my way down to the street. Normally I don’t like to go out without Linyan. But nowadays, I feel I’d be going out without Linyan even if I was perched right on her shoulder. So what difference does it make? Besides, I’m a grown Acrobat now… I can take care of myself. So I set out into the streets of Cybelline alone, looking for… something. Some help, or at least someone who can tell me what’s wrong with Linyan. I have entered one of the darker alley-passages not far from my home. And I’ve just heard a sound. My entire body goes as stiff as a statue and my eyes widen to their fullest, while my ears swivel to seek out the sound. My nose and whiskers twitch, smelling for the source. Something stirs in the darkness behind those crates over there. I hear a growl, soft but menacing. And it’s automatic… my legs act like springs, sending me flying up into the air and toward a low section of roof above me. I look down and see that I had jumped just in time… for there is another Acrobat down there, having just charged out of the shadows at me. He is bigger than me, and much more vicious… he’s been living on the streets for some time. I can tell. His fur is scruffy and his markings are a jagged mixture of black, red, and blue, with sharp triangular shapes. I hunch closer to the shingles beneath my paws, hoping that means he can’t follow me up here. Just in case, I hold my muscles tense. ‘I don’t mean you any harm,’ I chirp back at him as politely as possible. I falter. How can I explain this to him? He’s surely never lived with Whims. ‘Why should I tell you anything?’ he growls, getting some of his edge back. ‘That’s not good enough for me, boy,’ he persists. ‘I don’t have anything else I can give you.’ I’m starting to feel desperate. I hesitate. My tag? The tag that Linyan gave me? I hesitate some more, and he scoffs. He starts to move away into the shadows again, taking his knowledge with him. ‘Wait!’ I mew. I use my claws to slice the tag off my neck. It takes a moment or two, and I don’t like to sever the only thing that seems to connect me to Linyan anymore. But it comes off. Sadly, I let it drop down toward the other Acrobat, and it lands on the cobbled ground with a loud, sharp clink. I am truly surprised. ‘You can read Whimsy-words?’ I ask, astounded. ‘What happened?’ I ask, burning with the question. ‘How do you know that?’ That’s exactly what’s happened to Linyan. Has he been spying on me or can he read minds?? ‘You didn’t try to find out what was wrong and fix him?’ I ask. ‘No, no, no!’ I yowl tragically. I don’t want to see Ringmaster any more. I don’t want to believe what he says. I want Linyan back and I’m GOING to find a way. I leave him behind and bound away from rooftop to rooftop, feeling an empty coldness of the wind blowing by where my tag used to be. I gave that Acrobat my only remaining connection to Linyan, and for what? So that he could tell me I’ll never get her back! I can’t believe him!! I come to perch on the high point of a tall roof and huddle sadly, looking out. I can see much of Cybelline from here… it all looks so big and scary, and I feel so alone. Actually, I don’t recognize anything I’m seeing. None of the streets or buildings are familiar… I ran from that alley blindly and didn’t pay attention to where I was going. What if I can’t find my way back to my house? Now, I’m without a tag, and the name of the house is gone from me, so no one will know where I belong. A quiet, moaning mew escapes me… what have I done? And yet, there’s something else nagging at my heart… some memory. I have one memory from that moor that is different… one that doesn’t involve Linyan. I sit bolt upright. No… Ringmaster is wrong. I suddenly remember what else I experienced in that moor. I was so young, and the memory had faded to the background until now. But now, it’s coming back. It was winter… such a cold winter. Linyan and I had been playing in the moor, and I had strayed too far, and when I turned about, she was gone. I mewed and mewed, but I couldn’t find her, or the way back into Cybelline. I was out there until night fell, and it was colder than ever. Then, I’d found a shelter. A big old house rose up out of the frozen hills all around me, like a miracle. I was so cold and scared and lonely that I didn’t think twice; I ran right for it. The house was so old and full of holes, and I was so small, that I was able to squeeze through the cracks. Once inside, I found a warm presence and slept next to it through the night, not even bothering to check what manner of creature I had found. I was so lonely and cold I didn’t care. But when I woke, I found a Whim next to me. Yes, I remember now. It had seemed a funny place to find a Whim, so far from other Whims, but there she was. And she saved me from freezing out in the night. There was something different about her, I saw it and I sensed it even then… but I wasn’t scared. I loved her instantly, she saved me, and she was wonderful. She kept me close and safe until the next night, when she brought me home to Linyan. The memory of this strange Whim is filling my heart right now. Wow, I am feeling such a need to see her again. If only Ringmaster knew about her. She was not hollow. Far from it. She was filled with such spirit that it seemed to overflow. I recall now looking into her eye… she only had one… and there was so much spirit there that her eye literally glowed with it, when the surroundings were dark enough. The light of that eye seems to haunt me, to sing into me, like it’s somehow inside me as well. It makes me want to jump and flip my very best and let my heart sing out with the joy of it, for all to see. What IS that glow?? And why isn’t the strange Whim from the moor living here among other Whims in Cybelline, inspiring them, too, with her light? Well, whatever the reason, she’s how I now know for sure that Ringmaster was wrong. She is a Whim, above childhood, and she is not hollow. There’s hope. I can feel it. I just need to find her again… perhaps then things will make sense. Perhaps then I can find a way to cure Linyan of hollowness.